Show Hours : 10 a.m. to 5 p.m. The fair will overlap Basilica Hudson’s annual 24-HOUR DRONE: EXPERIMENTS IN SOUND AND MUSIC, which gathers hundreds of serious music fans for a 24-hour festival. Food and beverage will be available on the Basilica grounds throughout the day. When: Saturday, Oct. 11, 2014: 10 a.m. – 4 p.m.
Hudson is about 35 minutes south of Albany NY. It is also on the train line from NYC. The town is full of interesting art and antiques. Decent restaurants are also available. This is a fundraiser for WGXC Hands-on Community Radio. Regional and local vendors will gather with an unbelievable selection of vinyl, CD and DVDs for perusal and sale. The station will also sell records donated to raise funds. 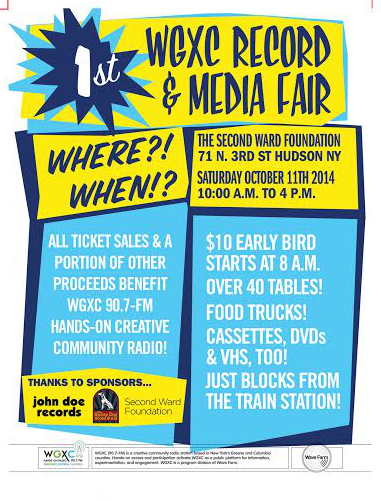 The Fair will feature live broadcast from WGXC DJs, live music, and more. Food trucks are also promised. The Second Ward foundation is a converted school, with a renovated auditorium and other facilities. Record fair sponsors include Second Ward Foundation, Spotty Dog Books & Ale, and John Doe Records, with more to be announced.